In the last Relationship Tuesdays, we talked about Love and Sin, specifically how sin can be boiled down to not loving God and not loving others. And when you really take the moment to think about it that makes perfect sense. If you loved God, you wouldn’t want to hurt Him, you wouldn’t want to disobey Him, and you would want to cultivate your relationship with Him instead of tearing it apart or substituting it with knowledge or empty religion. If you really loved others, you wouldn’t want to hurt them, you wouldn’t be selfish, and you would want to help them when they’re in trouble. And the truth is we’re all in trouble. We’re in trouble because we are not a loving people. Humanity is not essentially good, not essentially loving, and we haven’t been since Adam and Eve took the first step of not loving God all those years ago. Our natural inclination is to not love anyone but ourselves, aka be evil. Now I’m not saying we don’t have our loving moments, but even our most loving of moments often hold selfish intentions lurking in the background. 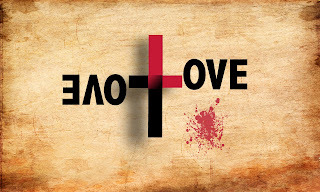 But God can’t abide beings that are not purely loving because, as John 4:8 so aptly puts it, God is love. He can’t watch them suffer without Him as they tear their lives and the lives of others apart, and so He introduced death into the world. God loved us enough to send His Son to die and be resurrected, so we too might die to our unloving natures, and He sent His Spirit to empower us so that we could be transformed to a point where those acts of love would not just be what we try to do but what we naturally tend to do. But by God’s grace, we can love our brother and we can love God because grace isn’t just forgiveness; it is the favor of God in love that we might love Him, love others, and spend eternity doing so. If this isn’t the outcome of the grace we think we have, chances are we don’t have it. Everyday we ought to be increasing in love for God and others. And that grace, while unmerited, is powerful and effective to accomplish it’s purpose within us. You cannot help but love if you truly know God’s love, and I’m not talking about a feeling. I’m talking about action and attitude here. Again refer to 1 Corinthians 13 to see what love is and isn’t. You’ll notice nowhere in the “love list” does it say, “love is a warm fuzzy feeling”. That warm fuzzy feeling makes people without Jesus do all kinds of unloving things. Serial killers get the warm fuzzy feeling when they kill people for goodness sake. Love ought never be defined by a feeling. It should always be defined by action. And that is why we can demonstrate the new love within us, given through God’s free grace, by obeying God. Jesus says, “If you love Me, you will keep My commandments.” John 14:15 Obedience is the ultimate act of love toward God, and it’s obedience with all our heart, soul, and strength. Which is why our next topic of Relationship Tuesdays will be Obeying God.